Disregard for legal obligations in property development is unwise, as a recent case shows. It involved a developer that high-handedly decided to build affordable housing in the full knowledge that the charity which owns adjacent land benefits from restrictive covenants which would thereby be breached. The charity intended to use its land to build a hospice for sick children. The developer obtained planning permission for and built nine two-storey houses and four bungalows. The construction of the affordable housing was a condition in the planning agreement that enabled the developer to undertake a much more substantial development project of much greater value. It was fully aware that the development would breach covenants in a 1972 conveyance that forbade the building of any structures on the land and confined its use to that of an open space for vehicle parking. When the development was complete, the properties were transferred to a provider of social housing. Some were already tenanted by the time the developer applied to the Upper Tribunal (UT) under Section 84 of the Law of Property Act 1925 to set aside or modify the covenants. In its decision, the UT was critical of the developer’s conduct, but modified the covenants so that the units would not have to be demolished: the potential impact of demolition on residents weighed heavily with the UT. The developer was ordered to pay the charity £150,000 in compensation, that sum representing the cost of remedial planting and landscaping required to screen the garden of the hospice from being overlooked. The charity challenged the UT’s decision and the case went to the Court of Appeal, where its appeal was upheld. The Court stressed the public interest in honouring contracts and ensuring that private property rights are upheld and protected. The developer had, with its eyes open and completely at its own risk, acted in an unlawful and precipitate manner by building in breach of the restrictive covenants. It was therefore appropriate that the developer should bear the risk that it may have wasted its resources in building the units. The Court’s ruling means that the covenants remain in force and that, in order to save the units from demolition, the developer will have to endeavour to negotiate a release from the charity. The developer had previously given an indemnity to the social housing provider that currently owns the site against any losses that might arise if the attempt to set aside or modify the covenants failed. 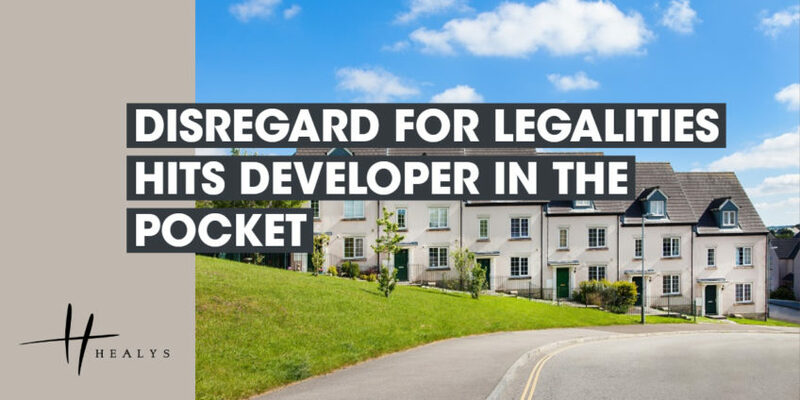 The outcome will inevitably prove expensive for the developer, which must also carry its own very substantial legal costs and those of the charity (on the ‘loser pays’ principle). It is hard to understand why the developer did not negotiate a release from the charity early in the process, when the bargaining position would be better and the final cost inevitably would be less. If you are considering any property development it is important to understand the legal position, and it is normally wise to make sure any issues like these are dealt with early in the process. The courts are seldom sympathetic to those who show a disregard for their legal obligations.